I made this top up a couple of weeks ago but had to wait to finish it because my coverstitch/serger was in the shop. One of the air threading tubes got clogged. I tried my best to clear it on my own but in the end I had to pay for a service. I don't like being thwarted by the machines . . . I found this wool jersey at the Great Textile Discount Outlet when I went there last fall with Gail. On a previous visit I found a teal version of this stuff, and was so excited to see it in this raspberry/violet color. You may have noticed that I have a thing for jewel tones, especially those in the magenta-fuchsia-raspberry-purple family. I love that family. I was going to buy 2 yards of the stuff until I heard the price, "Did you say $2.95/yard?!? Then I'll take 5 yards, kind sir!" Since I have 5 YARDS of this, I decided I could afford to whip up a quick long-sleeve version of my peplum top (drafted using bodice from Sew U Home Stretch plus slash/spread of skirt - see here for the first couple versions of this top and the steps for how I did it). What I didn't take into consideration was that this fabric has some crosswise stretch but NO (zip zero nada nothin') lengthwise stretch. When I first tried on the bodice (before adding the peplum) it was silly short. Empire waist short. So I decided this version would have a bodice band and I cut a 2.5" wide rectangle and slapped a double layer of it between the bodice and peplum. Why a double layer? I'm not sure, it just seemed like the right thing to do. I think I like the stitches best when they straddle the seam line of the binding. 5 comments on "On the Importance of Stretch"
This peplum top is beautiful and the colour is perfect on you. I bought some merino in a sale recently almost the same colour but not quite the great price you paid for your wool jersey. I think the infinity scarf looks really nice as does the lovely pendant your girlfriend made for you. I also recently bought a Coverstitch machine but due to Christmas and being away a lot, I haven't even taken it out of it's box and now I can't remember how to thread it etc. I like your finish on the sleeve hems so I am going to be brave and get that machine going!! Hey, Marjorie! I bet your merino is better quality than the stuff I got - with the Textile Outlet, everything is a big mystery. We'll see how well this holds up (see how suspicious I've become of fabric bargains??!). 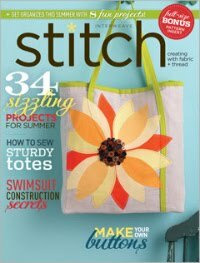 You'll love the coverstitch machine once you get past the threading. I signed up for Angela Wolf's Creative Serging class on Etsy and found her tips for using the coverstitch function really helpful. The most simple one is that the coverstitch does not like to sew only one layer of fabric. And my machine always needs to "warm up" on a test scrap when I'm using the coverstitch function. I hope I hear how it goes for you!! Thanks so much for the Coverstitch tips. I really should sign up for Angela Wolf's class as I am sure I will learn heaps. My merino is good quality but ithe piece that I bought was from the end of the roll and had some big holes in it. I will have to be really careful when I cut out or be very creative!! I'd forgotten all about that jersey! This is exactly how I got into trouble with the top I made last week - no lengthwise stretch! At least yours fits you, and it cute to boot! I didn't know how much difference the lengthwise stretch made! Glad I'm in good company with my mistakes!